MANJA – A British jewellery brand inspired by the cultural heritage of Madagascan design that spans across five generations. 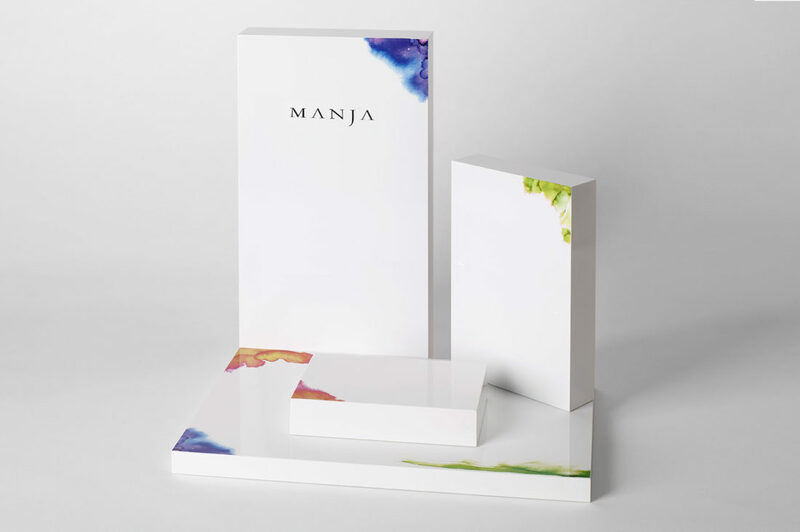 Launched in 2014, MANJA is the literal translation of ‘beauty’ in the native language. The team look towards nature, combining the elements with ideas drawn from European fashion and Western culture. The team behind the MANJA culture hold extensive knowledge of natural gemstones, high quality craftsmanship and an intelligent understanding of consumer desires. The inspiration for the use of watercolours came from the femininity of the MANJA design. I saw the beauty of the female vision within the jewellery itself and combined the use of photography and watercolour to represent this concept and to give more personality and authenticity to the brand. The gemstone colours – Turquoises, Amethysts and Rubies represent the natural stones themselves which form a part of the MANJA design. The colours invoke beautiful aesthetics, representative of the Madagascan inspiration behind them. I’ve worked closely over the years with the MANJA team, building the brand from scratch. My willing and commitment to adjusting to their budget and prioritizing their individual requirements has meant that I’ve built up a great relationship with the client. By creating and leading the professional team behind the MANJA brand – made up of a host of photographers, copywriters, illustrators and developers I’ve transformed the MANJA vision into a successful reality.